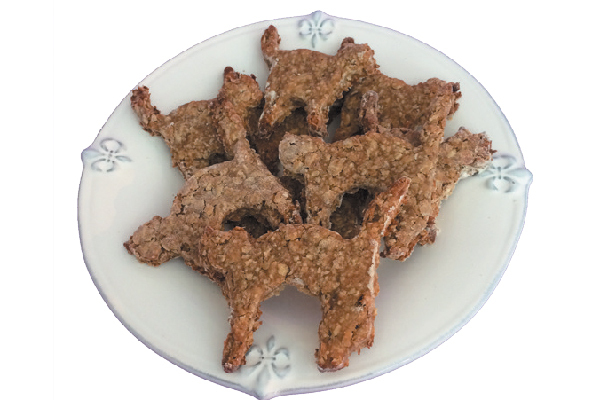 The post Spooky Peanut Butter Banana Dog Treats by Susan Rogers appeared first on Dogster. Copying over entire articles infringes on copyright laws. You may not be aware of it, but all of these articles were assigned, contracted and paid for, so they aren’t considered public domain. However, we appreciate that you like the article and would love it if you continued sharing just the first paragraph of an article, then linking out to the rest of the piece on Dogster.com. Bake your dog something scary-tasty this Halloween with this recipe for Spooky Peanut Butter Banana Dog Treats from Posh Celebrations. Spooky Peanut Butter Banana Dog Treats. Place rolled oats in food processor, and grind into flakes. In a bowl, beat together bananas and peanut butter until smooth with a mixer, then add oat flakes, and mix well. If the dough is too dry, add more peanut butter. If too sticky, add more oat flakes. Roll out dough on a floured surface to 1⁄4- inch thickness and cut out shapes using a mini cookie cutter (e.g., “spooky cat,” ghost or pumpkin). Find recipes, games and other pet party planning ideas in Posh Celebrations.